To identify the most effective treatment for your condition, it is critical that you determine which category you fall into. Click here to learn more about pain in the ball of your foot while you wear normal shoes. Ball of foot pain, or Metatarsalgia is most commonly experienced in women who wear fashion-forward shoes that have a medium to high heel and/or are very tight. People suffering from Metatarsalgia describe their pain as a burning sensation that is at its worst when the feet are in tight fashion shoes or high heels for extended periods of time. It is typically accompanied by the formation of excess callouses on the ball of the foot. What causes pain in the ball of the foot? Pain is felt when the forefoot bones (metatarsals) drop and surrounding ligaments weaken, which causes the entire structure of your forefoot to collapse. This increases the friction and pressure placed on the ball of your foot. When you wear heels, your forefoot area is forced to absorb 70-80% of your body weight, elevating the occurrence of pain. If you’re like most women, you don’t want to give up wearing your high heels and fashion shoes – but you do want relief from pain. Footlogics Catwalk insoles are the perfect solution. Simply insert them in your shoes and feel them support your arch and metatarsal bones, restoring biomechanical balance to your foot. Made in Spain, Footlogics Catwalk insoles are highly recommended by podiatrists in the UK, Europe and Australia. They work to distribute your body weight more evenly throughout your entire foot, as opposed to just the ball of your foot, preventing excessive pressure and friction on the balls of your feet and reducing the burning pain you feel. Women who wear our Catwalk insoles say they mimic the sensation of wearing low-heeled or flat shoes. 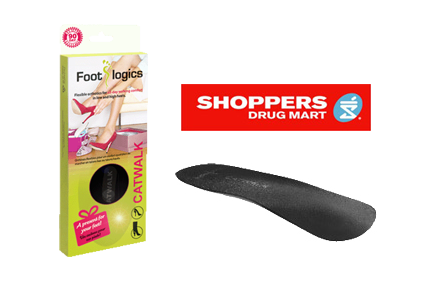 Catwalk insoles are available from your local Shoppers Drug Mart. Even in flats, both men and women can experience Metatarsalgia. The burning pain is sometimes present in the area surrounding the second, third or fourth toes and worsens when you stand, walk or run. The more you rest, the less the pain. Some people have described ball of foot pain as the feeling of walking with a pebble in your shoe, which usually makes walking in bare feet far too painful. Biomechanical research has shown that this last cause is actually the most common. Our feet have 26 bones that are held together with an intricate web of muscles and ligaments. The middle of the foot is held up off the ground by two arches: the Longitudinal Arch or instep, which runs along the foot from your heel to your toes, and the Transverse Arch, that runs across the foot from left to right. 5 metatarsal bones run from the middle of the foot to the toe joints. Over-pronation is when the longitudinal arch collapses and the ankle rolls inwards every time the foot lands on the ground. Excess pressure is placed on the metatarsals causing the Transverse Arch to collapse, which is a common side effect of over-pronation. The structure of the forefoot is weakened and the metatarsal joints become inflamed, causing pain. This condition is made even worse when you wear hard, flat shoes or when you walk on hard surfaces such as tiled floors, pavement and concrete. Orthotics correct the biomechanics of your foot and prevent over-pronation. More specifically, Footlogics Medical Orthotics re-align the feet and ankles by supporting the Longitudinal Arch and support the Transverse Arch with a metatarsal raise. The pressure and friction in the ball of your foot is thereby reduced, providing quick and sustainable relief from ball of foot pain.